The legendary King of the Hammers UTV race is right around the corner and our Polaris RZR-S entry and team effort is coming together perfectly, but not without a lot of hard work, late nights and great sponsor involvement. Like the 2011 King of the Hammers UTV race, we also want to let the mighty Polaris loose in the 2011 ECORS series. ECORS is an acronym for East Coast Off[Road] Series. It is a brand new series run primarily around the North Carolina/South Carolina/Kentucky area. The vehicles that compete in the series range anywhere from bone stock Jeep Cherokees to full-blown tube chassis, fire breathing, LS-powered off road race vehicles. The unique aspect of this series apart is how cheaply you can compete in it. For a few hundred dollars, you can pick up a used Jeep Cherokee, trailer it to an event, race it, and if things go well, drive it back on the trailer after the event. If things go wrong however, you may have to buy another Jeep Cherokee for the next event, but then you’re only out a few hundred dollars as compared to a few thousand dollars for vehicles in other series. This ease of entry is one of the main factors ECORS has grown so quickly. The other reason is how well the courses are laid out to include appropriate terrain for each class. The courses for the stock oriented classes are mostly comprised of fast, sweeping dirt road trails with the occasional minor to moderate rock sections thrown in for good measure. The more aggressive classes are faced with more challenging terrain. The end result is a course custom fit for each class, ensuring a challenge for all involved. ECORS did not have a UTV class in 2010. 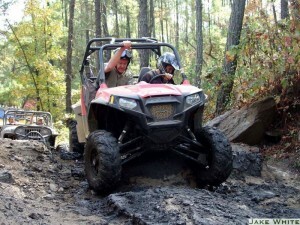 The series is too well promoted to not feature one of the fastest growing off road segments so I spoke with the promoters a few months ago about adding a UTV class for 2011. They were very open to the idea and even mentioned that some of their current competitors have also expressed interest in having a UTV class. 1. 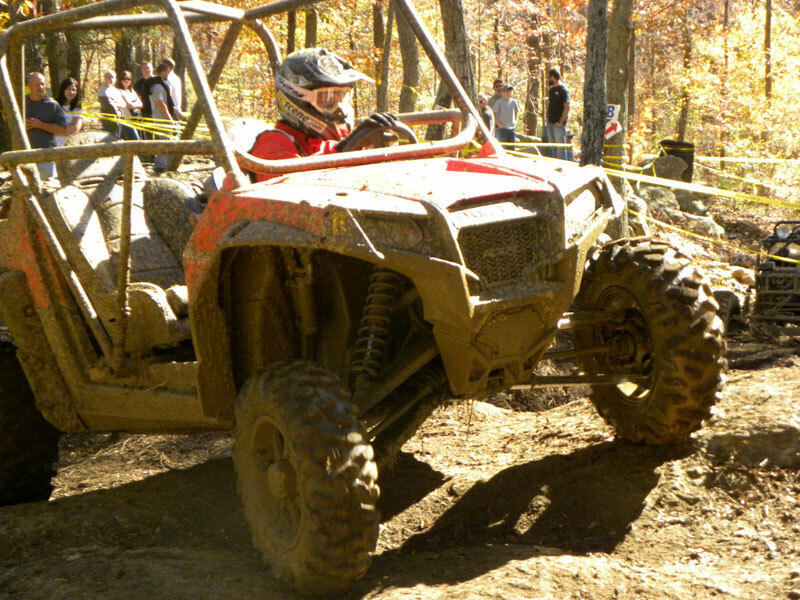 Wide courses – most of the UTV racing on the East Coast lies around the GNCC series, which is a very tight layout forcing a narrow UTV setup. The ECORS courses are primarily laid out for full-size vehicles, meaning UTV racers will be able to run a full-width race setup making them much safer and better equipped to handle the terrain. 2. Location – as the popularity of UTVs move from the West Coast to the East Coast, ECORS is perfectly positioned to take advantage of their East-bound growth. 3. Number of events – for 2010, there were five events on the schedule, stretching from March to September. Unlike a lot of race organizations where 10, 12 and more events are held, ECORS keeps the number to a minimum. This aids in keeping the racers’ budgets low and allows them to recoup funds between events. This not only applies to UTV teams, but to everyone at this point. ECORS is a series where you can get involved without the need to sell your other kidney. 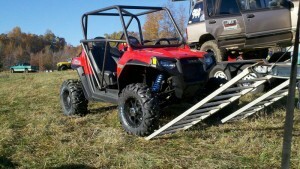 Most of us sold our first one to get the UTV in the first place, so selling the second one is not really an option. 4. 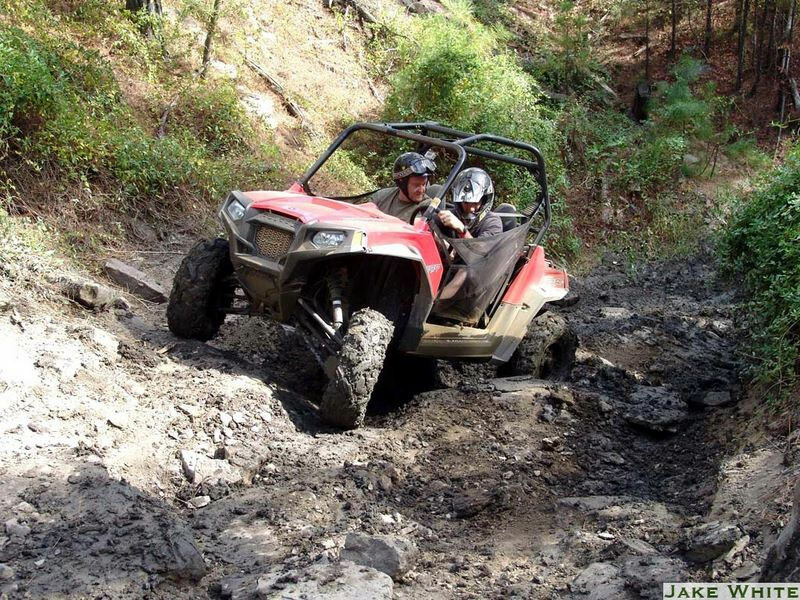 Fun – a little cross country terrain, a little rock crawl, a little high speed trails, it all adds up to a lot of fun! 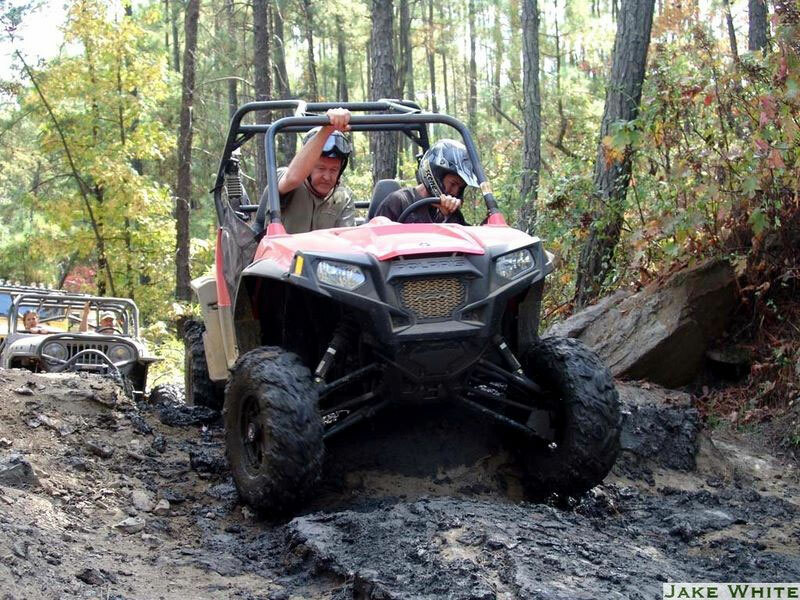 Besides the event’s fun-filled atmosphere, the well built courses offer high speed, no holds barred intense racing action – perfect for the UTV enthusiast. In working with the ECORS promotion team, we all agreed that it would be good to hold a UTV exhibition race at their last event in Silver Valley, NC to showcase what the UTVs have to offer. After quite a few late nights at Blue Torch Fab, (where thier team of professionals went above and beyond the call of duty to race prep our 2011 Polaris RZR-S), we were ready to hit the dirt with a full chromoly roll cage, PRP RZR seats, Maxxis tires, HCR long travel suspension, King shocks and Summers Brothers axles. This would literally be the first time our King of the Hammers Polaris would hit the great outdoors, other than a couple stock break-in rides. It would be a true test of the machine and the ECORS series. I hit the road on Friday evening at about 9:45 PM and drove straight through to Silver Valley, NC, by myself with little sleep the preceding nights. It was a true test of my motivation to get the RZR into a race. Upon arriving at the event, the RZR was well received. I was the only UTV there, so I was a little concerned that I would be singled out and the RZR would become the ugly duckling of the event. I couldn’t have been further from reality. Everyone there, competitor to staff to spectator seemed genuinely happy to see another type of vehicle compete in the event, but the verdict was still out on whether or not the RZR-S would be able to concquee some of the more demanding sections of the track. After the first couple of laps, it was clear that it would not only be competitive, but that we would need to separate the UTVs from the current competitors. between the our Polaris RZR and the many full size vehicles, except that we were all out on the same course with the throttle down and having the time of our lives. The HCR suspension and King shocks absolutely destroyed the course. This was the first time we had the RZR on the dirt, so the shocks were by no means properly tuned but they still provided an amazing ride that I’m still smiling about. HCR has a great reputation for building a great kit, but I was not expecting that much performance right out of the box. All of the drivers were very courteous on and off of the track and many of them even pulled over to let me pass during the race. I greatly appreciate everyone welcoming me and the Polaris RZR-S into their event. The exhibition was a resounding success, and so far so is our King of Hammers Polaris RZR-S entry. A few days after the event ECORS made the official announcement that they will indeed have a full-on UTV class for 2011! So if you are reading this and you have any aspirations to race a UTV, this series definitely deserves your consideration for 2011. The staff and competitors are very welcoming and have a great reputation for making off road racing accessible to everyone. I’m looking forward to competing in every ECORS event in the upcoming year. The schedule and event locations have not been announced for next year, and should be listed soon.